Cats Protection is attending this year’s Edinburgh Knitting and Stitching Show (27–30 April at the Royal Highland Centre in Ingliston) where copies of the popular Captain Cat Battler knitted mouse toy pattern will be available on the stand for people keen to knit for the cats and kittens in our care. Cats Protection’s Events Manager Emma Osborne said: "We've met so many cat lovers at the Knitting & Stitching shows who want to help unwanted felines in some way. Supporting our knitting bee by making a toy or knitting a blanket or two is a practical way of doing this whilst also doing something you love." 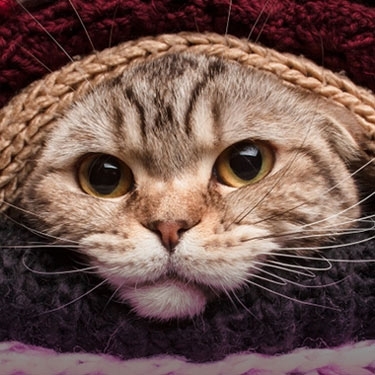 Cats Protection advises that when knitting a toy or blanket, it's best to avoid the use of stretchy yarns or small plastic items – such as those that can be used for mouse eyes – to reduce the risk of injury to cats and kittens. Loose weave blanket patterns involving the use of large needles are best avoided too. The charity also suggests that cat owners regularly inspect cat toys for signs of wear or damage, not to leave cats unattended with knitted toys, and not to use knitted toys or blankets with cats that have wool-chewing habits. Donations of knitted goods can be dropped off at the Cats Protection stand at the show, or at any of the charity’s branches, shops or adoption centres. For a full list of the shows that Cats Protection is attending this year, please see below. Cats Protection is the UK's largest cat charity, helping around 500 cats a day – or 200,000 a year – through a national network of over 250 volunteer-run branches and 32 centres.